Karla writes, "Well, I am single but my boyfriend works and he pays for my four kids and my expenses. 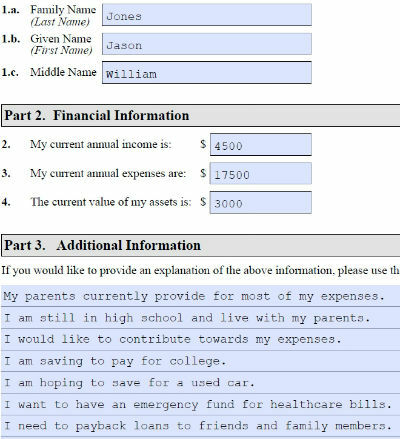 I don't know what to answer for income and expenses. I don't know if I should put just mine or also include their expenses. I do want the work permit because I want to be independent and help with my kids' expenses. Help me please!" So for income, if you are not working, then write zero. Now, imagine if your boyfriend would dump you or lose his job, what would it take for you to pay for you and your kids? Those are your expenses. They should include housing, food, utilities, transportation, education, clothing, daycare, etc. If you own anything valuable, write down in your assets. Do not write down things that belong to your boyfriend because in reality they are not yours even though you may love each other and when he is being romantic, he might tell you every day that they are also yours. Now, finally, in part 3, write something like, "I would like to work not only to help my boyfriend with the expenses, but also to be independent so that if our relationship falls apart, I would not be on the streets with my four kids." Should I hide my money from USCIS to justify economic necessity? Henry writes, "Since I am approaching my 30s now and have been working hard over the years, I have managed to save money that I keep in my bank. 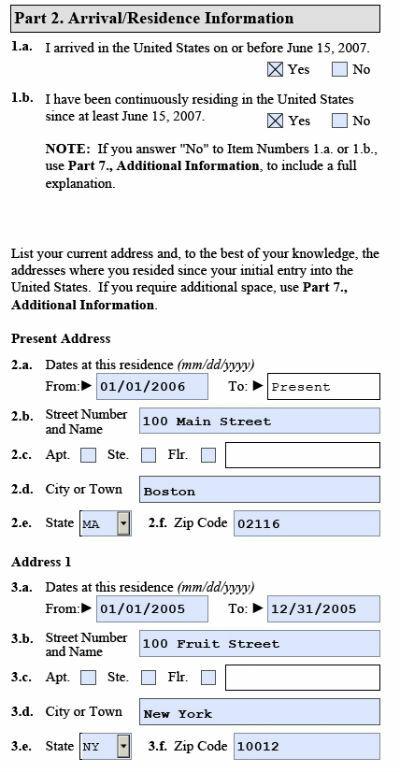 I know I have to provide information on my assets in in I-765WS but I was also planning to use my bank history as evidence of my addresses and to prove that I have been in the country. In order to justify an economic necessity for a work permit I am afraid that having over $25K, that I have, might hurt my case. To get a legal opinion, I talked to an attorney and she told me that I should transfer my money to someone else to show that I have very few assets. Is it the right thing to do?" Now, obviously you should listen to your attorney, because I am not an attorney. Still I do not agree with her advice that you should transfer the money to someone else because basically you will be trying to provide misleading and false information to the USCIS, which can not only lead to rejection of your application, you may also be prosecuted (though realistically that probability is low since perjury cases like this are rarely pursued, though, it can be used against you in an immigration court if you were being deported). It addition, you will be doing something that can be easily caught. Your bank will keep the history of that transaction for years and USCIS can get that information with a few clicks (to see that someone just emptied out their checking account just before applying for a work permit due to economic necessity is a big, screaming red flag). Maybe you can get away with this, and maybe thousands of immigrants get away with tricks like this all the time in dealing with the United States while getting a visa or to immigrate here, but I cannot recommend doing this because it is immoral, illegal and there is a huge risk of being caught, maybe not this time, but at another time. Why will USCIS punish DREAMers for working illegally when everyone is doing it? Billy writes, "I am already 25 years old, I have been in this country forever, have a college degree, and have been working illegally with a fake Social Security number for many years. I do not think this fact is not known to the authorities that millions of illegal immigrants are working without papers. So looking at your opinion and those of other legal experts that I should not apply for DACA because I have broken the law seems a bit illogical to me. Wouldn't they consider the fact that people like my age and education wouldn't just stay at home and not work? I am frustrated that while doing the best I could to make my life better is now going to hurt me." Working illegally is a serious crime and may not be ignored: At this point no one knows what will happen to those who have worked illegally, because USCIS has not given any guidance and no cases have been decided yet. What you are saying is logical from a humanitarian point of view but if I understand it right, the program does not condone illegal behavior of any type. There is no amnesty built in to the executive order and while working without a SSN sounds like a harmless thing to do by an undocumented immigrant who risked his life to get here or constantly lives in fear of being deported, in reality, working without an authorization is as serious as any other felony. I am personally not yet convinced that USCIS will approve these cases and basically send a message to everyone that you can simply use a fake SS# or other documents like a green card (or simply tick the US citizen box on the job application) and there will be no consequences. As it is there is strong opposition to the decision on legal grounds because it condones illegal behavior and encourages others in the future to engage in similar behavior, but letting people get away with a crime will be shocking to anyone. Any decision by the USCIS has huge consequences on the whole legal system because if applicants like you were approved, many other immigrants who are being prosecuted for identity theft or working without authorization can make a case in court that charges against them should be dropped as well. In addition, USCIS will need to approve other immigration cases in which the applicant work without authorization or broke other similar laws. Applicants with doubtful cases should wait: My personal recommendation for anyone with gray areas like yours is to simply wait for a few months and watch what happens. Maybe USCIS will indicate that they are willing to forgive working illegally (and people like me were to wrong to interpret the law in this strict manner or they have identified a loophole to help the childhood arrivals candidates) or that USCIS prosecutors simply did not investigate each application carefully or that this is not even a criteria in the internal memo within the Agency or that while people worked without the right to work but created no paper trail or evidence that can lead the prosecutors to find out about illegal behavior (here people who got paid under the table in cash and never filed their taxes may benefit while those who were honest in filing their taxes will be punished), or alternatively, we might hear from other applicants that their applications got rejected because of this. If you have been like this for so long, another 4-6 months may not make a big difference, even though it is so tempting to get as soon as possible an EAD and then a valid SS# and driver's license. How much assets do I need in order to qualify for a work permit? Charlie writes, "I graduated from high school and then got a degree in Business Marketing. After I graduated in 2008, I started working odd jobs here and there and built my saving account to about $25K. In the USCIS Form I-765WS it states that they would only give EAD to only those who can show an economic necessity to work. So I am afraid to submit this information in the Asset section. What is the best solution for me? I know this will be the only time I will have the chance to get my EAD and DL, so please advise. When I submit my Bank Statement to show evidence for DACA it will show my assets too, so I don't want to risk myself by lying and getting caught either." Reasonable amount of assets are not an issue: For most reasonable people, as hard as it is to save $25,000, it isn't a whole lot of money. If you think about it, since you are not eligible to finance your car, this is the amount you will need to buy a new car. Or if you get really sick, and assuming that you do not have health insurance, just a few tests and a night in the hospital could run you thousands of dollars. Or if you have to live by yourself and pay for everything, $25K may not even last a year once you factor in the cost of housing, food, transportation, etc. Now, USCIS has not given any guidelines about how it will look at these numbers and if there is a cutoff, but it is fair to assume that if you had hundreds of thousands of dollars in assets, then, it is a fair point to ask why you need to work while millions of Americans are unemployed. Therefore, I would not worry about such a small amount. USCIS is going to be reasonable if you have a story to tell: I encourage you to report all the information accurately. In the explanation section, you should provide a short statement how you have saved this money for a new car or for a medical procedure or just as a safety net for your family (these are just examples and please add your specific story that you can provide evidence for and substantiate if asked by USCIS). You can add that if you get a work permit you will be able to spend some of this money knowing that you have a paycheck. The only thing to watch out for is that since you have been working without authorization, this will raise a red flag. I have highlighted previously the dangers posed to DREAMers by Mitt Romney (remember he is the guy who has promised to veto the DREAM Act, so even if the Democrats control Congress, he can kill it), and even though, in order to fool the Hispanics into voting for him, he did mention that he might sign a DREAM Act only for for those who serve in the US Military, it looks like he said that only to win the election. What are the consequences of using a fake Social Security number? Many of the DREAMers applying for an EAD are struggling with the issue of their past use of a fake/false SSN to work illegally. Obviously, the USCIS, DHS, and IRS are aware of it, and at this time the application process for the work permit under the deferred action childhood arrivals does not provide any guidelines on what happens if it is found out there is no match between your name and SS#. There is no consensus among attorneys either right now and while one legal opinion is that there is no need to report any numbers that you have used to work in the past because these are not your numbers anyway, while other experts think that all numbers should be listed. Obviously, each case is unique and everyone should consult with an attorney to get a legal opinion, but this is a very complex situation, and can have serious consequences not just for a work permit under DACA but also for future steps like DREAM Act, green card (permanent residence), and eventually citizenship. There is no doubt that identity theft is a federal crime and states have other related laws, and as far as immigrants are concerned any claim at any time to be an American citizen is a serious problem even if you are not prosecuted for it (prosecutions for identity theft alone are rare but when it happens in conjunction with another crime then prosecutors will add a charge). Surprisingly, the US Supreme Court has ruled (in the case of Ignacio Flores-Figueroa) that an immigrant who simply uses a SS# (belonging to someone else that he or she purchased from a criminal or simply pulled out of thin air and depending on what it is, it may or may not belong to someone else) for the purpose of employment is not committing identity theft because he is not knowingly using that information belonging to someone else (and he is not stealing that person's name, address, date of birth, etc. only the SSN). So theoretically, if you used a number that belongs to no one, you have committed no crime. On the other hand, if you cooked up a number that turns out to belong to a real person, you still may not be in trouble as long as the intention was not to cause deliberate harm to this individual. In that sense those individuals who have been using social security numbers belonging to someone they know well (because it is a deliberate action even though the person may have given you implicit permission to use it, though, that itself is a crime), or it belongs to a real individual, may have more to lose than those who simply picked a random number or bought a number from a crook. So what are the implications? It is indeed true that at every point in the immigration process, various agencies would want to know if you have ever used other numbers or claimed to be a US citizen (those illegal immigrants who simply check the US citizen box in an employment application in order not to submit any proof of their authorization to work are in deep trouble when it comes to legalizing their status) and the outcomes may depend on individual situations, ranging from outright rejection of applications to prosecution and deportation. Chances are that most applicants for this process will be approved for a work permit without any hassles (it is not expected that the USCIS will refer cases of identity theft to prosecutors because DACA merely defers action on deportation for two years at a time but does not grant any legal status), but in many ways the process of enforcing these laws is totally broken. Many applicants can get away with no consequences, but depending on individual situations, it could also result in complications with approvals of legal status/permanent residence/naturalization. It is best to discuss this with a lawyer well versed in immigration and identity theft matters. Should you apply for DACA if you are in a situation like this? The simple answer is that right now there is no guidance from USCIS how it will treat applicants who have used a fake social security number for employment. Even if the agency does not bother with prosecution, it may simply reject the application due to the crime committed. What may happen, though, is that at some point, USCIS will clarify this because many attorneys are already screaming about this. In addition, applicants with this problem who have already filed and are either approved or rejected will go online to provide updates on their cases. So if you want to be super-safe, in addition to working with an attorney to deal with this dilemma, you may wait and not file your application till there is more information available. Update on June 5, 2014: The information below is outdated since the USCIS changed this form. 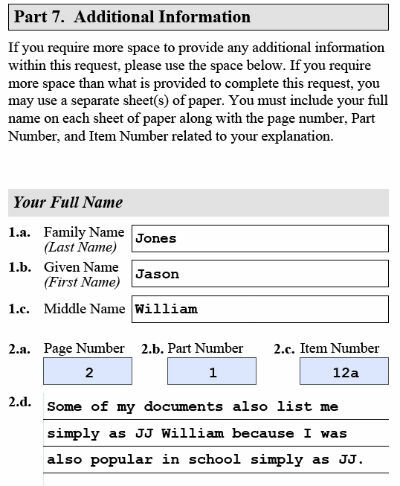 Please use the completed sample example of the latest USCIS Form I-821D instead. In order to receive a work permit by DREAMers, one of the three forms that they have to file is USCIS Form I-821 D and the purpose of this form is to assess if they are eligible for deferred action for childhood arrivals. Here are some helpful tips and suggestions along with examples of answers. For Part 1, Information About You, pull out your passport and birth certificate, and complete the questionnaire as accurately as possible in black ink or type it out online and then print it in black and white. The mailing address should be the one where you currently live or some place where you can definitely receive your mail, because this is the address to which the USCIS will mail all letters. If you live somewhere you are not confident that all your mail will be delivered to you, provide an address where someone who cares for you. Even better, get a post office box somewhere for the duration of this process so that your mail will not be displaced. The last thing you want to have is lost mail from USCIS. 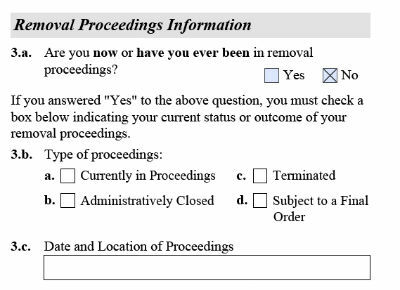 As far as removal proceedings are concerned, I am assuming that the answer is NO, because if the answer is YES, I would expect you to use an attorney to do your paperwork. For question number 4, if you were ever assigned an A#, complete it. This number is generally provided to applicants for immigrant visas. If not, leave it blank. Similarly, if you have a social security number (even if it does not authorize to work and you have never worked using it), provide it here. 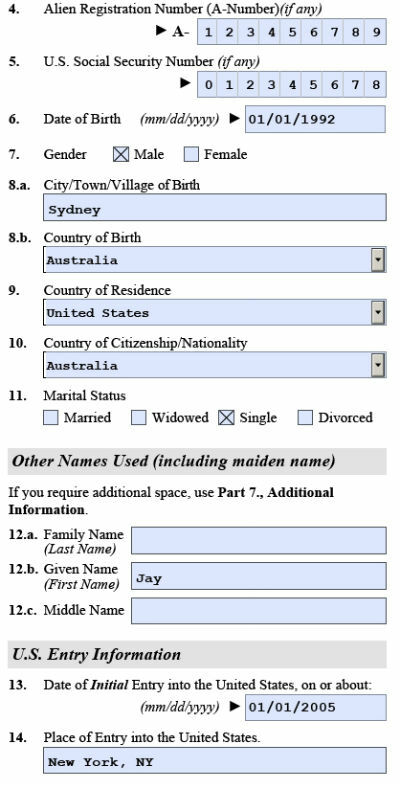 If you have used a fake SSN or that of someone else, consult an attorney because this is a serious crime and could be grounds for rejection of your application (it is likely that at some point USCIS may clarify this issue and give guidance on what it intends to do in such cases, or alternatively, you can wait to find out what happens to those applicants who are applying either by not providing this information or admitting to a crime). If you simply do not have one, leave it blank. Questions 6 to 11, are straightforward, and make sure that for country of residence, you pick the United States, because that is where you should be living in order to be qualify (the simple definition of 'country of residence' is whatever country you have been living for some time even if you are not here legally; in this case, it is the US -- your nationality tells the authorities where you are legally a citizen of). Regarding other names used, this is your chance to provide if you have more than three names or your names were switched or you changed names after marriage, or if there are spelling differences in your names on your passport/birth certificate/high school certificates. Provide further explanation later on if it is still confusing. Starting from items 13 to 17, enter your date of entry into the US, even if you are not sure about the exact date. Enter the airport or land crossing name if you entered with inspection, otherwise, enter the name of the town closest to the border crossing if you simply crossed without inspection. 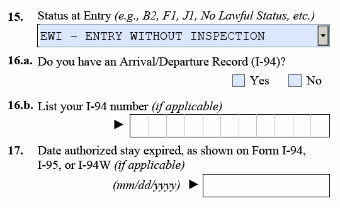 In #14, pick the category that your I-94 has; otherwise, pick entry without inspection if you simply crossed the border illegally. If you have Form I-94, enter the information, and if you have lost it, leave it blank, but provide an explanation at the end. Filling education details should be simple and straightforward and you should have correct documents to prove your education credentials. If you ever served in the military, get your file out and enter all the details. In Part 2, arrival/residence information, you will hopefully answer YES to both, if not, you might need to discuss your case with a lawyer. Or you might not be eligible to apply. So make sure that you under eligibility requirements for deferred action for childhood arrivals. Under present address, provide your address where you live, even if it is different from your mailing address you provided earlier. If you have ever lived at any other places, provide all those addressed going all the way back to your initial entry. Do not stop at June 2007. You need to include each and every single address unless you were there for days/weeks. Regarding departures from the US, again, I am hoping that you do not have any departures, because if you do, you better seek legal advice. In part 3, criminal, national security and public security information, I expect that you will answer NO to all five questions. Remember that speeding/parking tickets do not count, but if you have had trouble with the law, speak to a legal professional first. In part 4, since you are filling the application yourself, pick 1(a), date and sign your name, and provide a telephone number that either you will answer or someone who speaks English can take a message. Make sure that you have voice-mail or answering machine on this number so that someone can leave a message. Part 5 and 6 are not meant for anyone completing the application on his/her own and if you are using a professional to fill it or using an interpreter, they will fill it, and that is why it is not valid for this article. Complete your name in such a way that it is consistent with I-821D and I-765. For current annual income, if you have a regular, full time job, simply use the information from your pay stub. If not, simply add up the money you have made so far and estimate what your annual income is going to be. However, if you work casually here and there performing small jobs, and do not have a steady job, simply add up whatever you were paid. Do not forget tips and cash payments that you might receive, for example, in odd jobs. If you made no money, for instance, if you are still in high school or simply do not have a job, write zero. Keep good records of your basis, and definitely anything that can prove your income, because if you receive a request for evidence, you will have everything ready. For current annual expenses, add up all the expenses that you or your family incurs on you. If you live independently, this Math is simple because you can include expenses like college tuition, rent, food, gasoline, taxes, living expenses, etc. If you live at home, do not include what you do not pay. For example, if you do not contribute towards rent paid by your parents, do not include it. On the other hand, if you pay towards groceries or pay your part in a cell phone plan for the family, include that. Any expenses that your parents are paying for right now but you intend to pay them back, for example, college tuition, include it in your expenses. Keep good records of your calculations, for example cell phone bill copies, and be ready to submit that to USCIS, if asked for. Also be prepared to explain to an officer why certain expense is included. For example, if you party hard each week with your friends and blow a hundred bucks on alcohol and food, do not expect anyone to be convinced that it is a reasonable expense and should be considered an economic necessity, regardless of how essential you might think hanging out with your friends is. For current value of economic assets, make a list of valuable things you own and assign a reasonable value to them. Unless you own very expensive clothes or gold/silver jewelry or other valuable items, they have no value because your jeans and tee shirts are pretty much worthless. However, if you own a car that you paid for (a car provided to you by your parents is not your asset) is an asset as long as you can sell it and get some money in the used car market. And remember that you may have paid $500 for a computer or electronics, if you try to sell it on Craig's List, it is most likely worth just $50. So value it accordingly. Keep this calculation in your application file and be prepared to present it at a later time if asked for by USCIS. Do not write zero, unless you really have absolutely nothing of value. If you own property and/or other valuable assets anywhere in the world, they should be included here, though, you can provide an explanation that they are overseas and not available to you at this time. In Part 3, Additional information section, even if you have low income, high expenses, and minimal assets (thus, making it very obvious that you need to work due to an economic necessity) you should still provide a short and sweet explanation why you need to work. USCIS has put this as a requirement and you should do your best to convince a reasonable person that it is essential for you to work. Remember that unlike the rest of the population that can work for whatever reason, you do not have that right. This is a privilege being extended to people who are here illegally and that is why the bar is higher. I have provided some sample statements that you can include so use them if they fit your situation. Otherwise, honestly explain why you need to work. What to do if I used fake social security numbers? Marcos asks, "Form I-765 asks for my social security number. I've used two different social security numbers under my name, one of them was my grandfather's when he was alive, and the other belonged to my elder brother. Should I write down both of them? Any of them or none?" If you have been assigned a SSN by the Social Security Administration, and you have never worked, simply list this number. If you have been assigned a SSN by the SSA and it clearly says 'not authorized for employment,' and you have worked using it, consult with a lawyer. If you have bought a fake number from a crook or just decided to use a number of someone you know or simply made up an imaginary number to work, consult with an attorney. Remember that the only SS# you really have is the one in your name and unless you were clearly authorized to work and the card does not state "not authorized for employment," working is a federal crime. Typically, as soon as any agency runs a name/number match and they find a mismatch, they know that the number is not valid for the applicant. By reporting one or more false social security numbers, particularly if they belong to US citizens, you are opening a can of worms by claiming to be an American when you were not - a pretty serious crime, and that is why legal help is a must. Alternatively, you could simply wait to see what happens. Either USCIS may give clearer guidelines in the coming months on how it intends to deal with this mess (which everyone is aware of since at least 10 million illegal immigrants are working using false numbers) or you will find out online what happens to those applicants who have filed their applications and have either reported or not reported their use of other people's numbers. If USCIS starts to reject all applicants who used fake numbers, it would be best to not apply. In case you have no number at this time, after you are approved for a DREAMer work permit, you will be able to go to the Social Security Office and get a new one (even in the State of Arizona or Nevada because this is a federal benefit rather than state). Eduardo writes, "Item number 3 of the form I-821d requires me to answer if I have ever been in a removal proceeding? I have never received an order of deportation, but I did have contact with the Border Patrol while trying to sneak through the US-Mexico border. The officers only fingerprinted me and took me back to Mexico. I sneaked back to the US in less than a week. Should I check YES or NO?" A removal proceeding is legal action in which authorities get an order from an immigration court to remove a person from the United States who is here illegally. This will typically involve an arrest, imprisonment, court proceeding, and then eventually deportation. Now, legally you were not in removal proceedings (the rules for border enforcement within a 100 mile distance and on airports/seaport are different and anyone can be turned away without a legal proceeding) and can answer NO to that question. However, in part 7 and under item 3(d) you should explain what happened when you were sent back. Remember when they run your fingerprints through the database that record will show up in your record and the USCIS will like you to report that voluntarily. 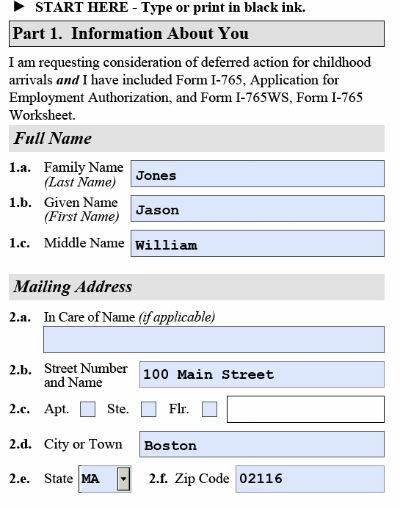 How to complete Form I-765WS for deferred action for childhood arrivals application? To receive a work permit under the Deferred Action for Childhood Arrivals process, the USCIS requires you to submit a complete package consisting of Form I-821D, I-765, and I-765WS, the document that demonstrates an economic necessity for employment. Like the other two forms, this is also really simple and you even wonder why anyone would even ask for it, but it is important to fill this truthfully and accurately. Under part 2, question #2, if you working (illegally, of course), you should provide your income accurately. This number should be reported even if you were being paid under the table. It is tempting to not report your income on which you are not paying taxes or your employer is doing something fishy, but if you do not tell the truth, you will be lying, and that is worse. If you lie is caught, your application will definitely be rejected. The worst outcome in the other case is that you might owe some back taxes, though, most experts doubt if things will work like that. Under part 2, question #3, put a total of all your expenses. If you live with your family, you can divide the cost of food, housing, etc. among all the members, and report a number for you. Obviously, expenses that are only for you, like education, car, phone, books, etc. should be included. Under part 2, question #4, include the money you might have in the bank or any other valuables that you might own. Your clothes and cell phone do not count, but include the value of a car, land, stocks, homes, jewelry, etc. even if they are overseas. Merely owning assets will not disqualify you from a work permit. The USCIS understands that you want to work even if you do not need the money to survive, because someone did not go to nursing school to sit at home her whole life. In part 3, you can provide an explanation if something is out of the ordinary. For example, if you have huge assets outside the United States, you can explain why you do not have access to the assets to pay for your expenses. However, if you have low income, reasonable expenses, and little or no assets, then, there is no need for any explanation. Can I get a work permit if I do not have the documents? If you have seen the list of eligibility requirements to get the work permit for deferred action under childhood arrivals process, it is complicated. Most people did not expect that some day the US president will give an order like this and that would require documentation to prove entry into the country or presence for a certain period of time and such other qualifications. That is why most of you might not have anything more than a birth certificate or passport in addition to documents about school attendance and such. So what can you do? It seems that you are out of luck. Your chance of taking advantage of this provision is gone, though, I would recommend that you consult with an attorney to see if something can be done. Will I be able to appeal if my work permit is denied? Due to the fact that prosecutorial discretion is so important in giving work permits to illegal young immigrants under the DACA Process, there will be cases where your application is rejected. In many other immigration approvals by the USCIS, even visas in foreign countries, an applicant can appeal the decision by showing why s/he should be approved. Unfortunately, since this is not an immigration petition, there is no appeals process. The only course of action left for you is to file another application, pay the $465 fee, and explain why you should be reconsidered (the rejection letter may explain the reasons). An appeal will make sense if you think that the adjudicating officer (the decision maker) misunderstood something or that you did not provide credible evidence in your application or that something else went wrong. That is why it is very important to get it right the first time when you file your application. If you get rejected and unless it was a straightforward case (e.g. you did not conclusively prove that you were in the country on June 15, 2012 but you do have the evidence that you failed to provide) it is best to seek legal help before an appeal. How to get a fee waiver for Deferred Action for Childhood Arrivals work permit? The fee to apply for an employment authorization document under the deferred action for childhood arrivals process is a whopping $465. In case you wish to travel after the approval plan on paying an additional $360. It is fair to say that putting together the documents, photocopying, shipping, etc. will raise the total cost. If you are going to use an attorney to do the EAD paperwork, that can add up to hundreds of dollars as well. You will also need to drive to USCIS offices once or twice and that means you will need transportation. Do not be surprised that when you show up in a large city like Boston or San Francisco, even parking can easily cost you $40. My recommendation is that tap into your savings, borrow from a friend, or do what it takes, but try to come up with the money. Yeah, it is a a lot of money, but you are going to get a work permit and your life will be so much easier. What if you simply don't have the money? The USCIS will grant exemptions if you demonstrate that you are simply too poor. Doing that is not going to be easy because you will either need to be homeless, or clearly prove through documents that you do not have the money. If that is the case, it is better to do the paperwork because the USCIS will first need to approve your application to file for free and only then you will be able to file Form I-821 D. This simply means that you will face massive delays.